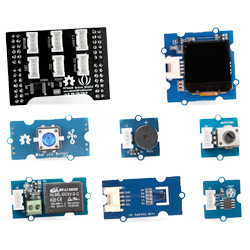 Available from Mouser, the Seeed Studio Grove Starter Kit for Azure Sphere MT3620 is a basic starter kit that integrates the modular Grove system. Get started quickly and experience Azure Sphere solutions. The kit is needed but not included in this Starter kit. Microsoft Azure Sphere can create highly-secured, connected, MCU-powered devices. Azure Sphere brings together Microsoft’s expertise in cloud, software, and silicon, resulting in a unique approach to security that starts in the silicon and extends to the cloud. Together, Azure Sphere certified MCUs, the Azure Sphere OS, and the Azure Sphere Security Service produces the confidence and power to reimagine business and create the future.